According to the Indian tax laws, an adjustment increases only the taxable income of the taxpayer in recent times. It does not address the remittance issue of the difference between the arm’s length transaction price (when both parties involved in a deal are acting in self interest without any pressure from the third party) and the transaction price. A secondary adjustment is an adjustment which arises from imposing tax on a secondary transaction. On the other hand, the Transfer Pricing refers to the price at which different departments of a company can transact with each other, i.e. the trade of goods or labor between the departments. Transfer prices are generally used when an individual entity of a large multi-discipline firm are treated as separately run entities. Recently the Central Board of Direct Taxes (CBDT) has introduced some rules in the Finance Act 2017 to operate the provisions of the secondary adjustment in case of Transfer Pricing. The Finance Act 2017 must have significant effect to the secondary adjustment norms. These norms are based on the transfer pricing guidelines of OECD (Organization for Economic Co-operation and Development) for multinational companies and tax administrations. 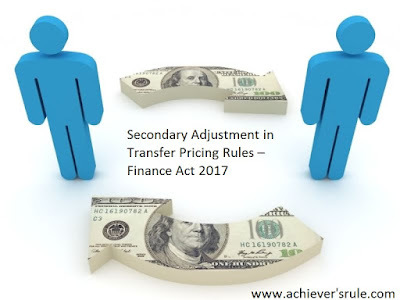 As per as the Finance Act 2017, an upward transfer pricing adjustment can be made on the income of an Indian company which has earned some facilities in revenue by transferring goods or labors to another company under the same parent group or its associates in abroad. In that case, the additional amount should be brought back to India within a particular time. Failing of which may be treated as a loan offered by the Govt. of India and certain interest and a tax must be paid along with the principal amount. Apart from that, CBDT also implement 10CB rule which states that the time limit for paying back the excess money from those overseas branch companies and the interest rate which may be added in case of failure to repay within the stipulated time. According to the Ministry of Finance, if the primary adjustments of a company exceed to 1Crore Rupees in the assessment year 2017-2018 and onward, then the time limit of 90 days to repatriation of the excess money must begin. In addition if a transfer pricing is ordered against a tax payer, the time limit for the repatriation of money would be counted only after the approval of the appellate authority. The annual rates will be different for the international transactions denominated in foreign currency and Indian currency. Price Waterhouse & Co Leader Transfer Pricing Kunj Vaidya commented this rule as a much wanted relief from the potential comparing prospective impact.